Do you love having beautiful centerpieces for the holidays? How about that perfect gift to make an older relative smile? For me, the holidays have always been a special, happy time. It is a time where family gets together and I try hard to make others smile with the perfect gift. 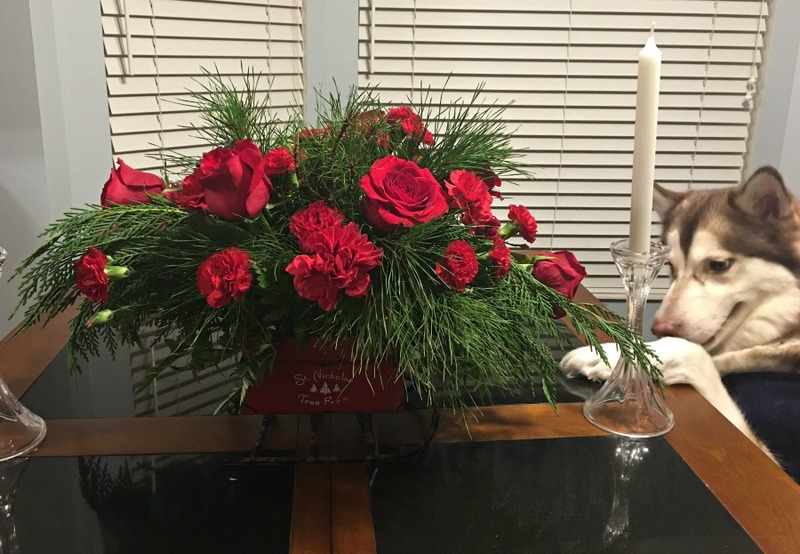 For relatives who are further away, I love sending them a beautiful flower arrangement for the holidays since it allows them to have something special to look at during the holidays and let them know someone cares. I especially love arrangements that can be used as centerpieces and in many cases, send a similar arrangement that I purchase for my own table to make it light up during holiday festivities. When it comes to finding the perfect holiday floral arrangement for my table, there is only one company I trust – Teleflora. 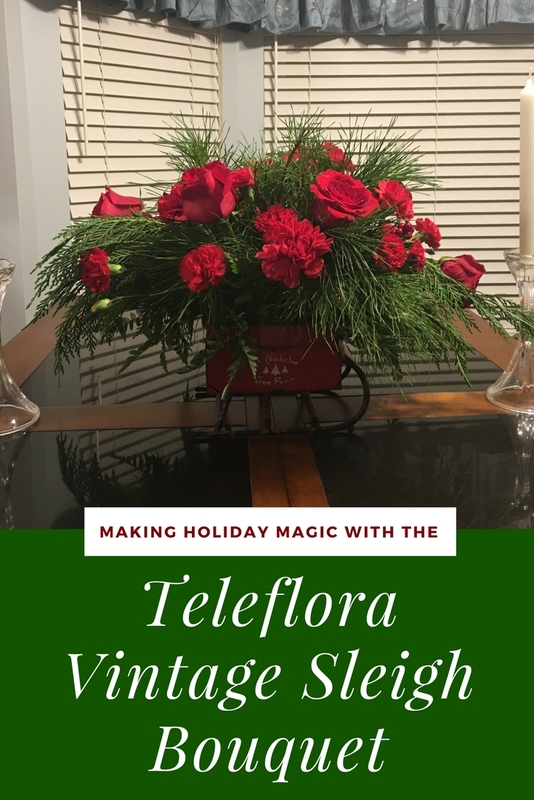 This year, I found what I thought was the perfect holiday arrangement – the Teleflora Vintage Sleigh Bouquet. Teleflora Vintage Sleigh Bouquet: What is It? Looking for a truly gorgeous flower arrangement to make someone smile this holiday season? If so, we think you will love the Teleflora Vintage Sleigh Bouquet. This charming arrangement is set in a vintage sleight with beautiful red blooms and the fresh scent of Douglas fir and cedar, accented with cute copper ornaments and snow-tipped pinecones to give that perfect touch of the holidays. With its fun, vintage design, it is great as a fun centerpiece or as a fun way to tell someone special in your life that you are thinking of them during the holiday season. Since each of these arrangements are by hand, with love, by local florists in the Teleflora network, the Teleflora Vintage Sleigh Bouquet is a great way to let anyone know you care! If there is one thing I always look forward to it is getting an arrangement from our local Teleflora florist. We almost always have the same person bring the flower, who is happy, cheerful, and it is obvious they take a great deal of pride in their work. When you are working with a Teleflora florist, you are getting a florist who truly love their job and flowers, at least from my experience. As for the flowers themselves, the Teleflora Vintage Sleigh Bouquet was absolutely. As you can see from the picture, it was overflowing with gorgeous red flowers and beautiful evergreens. The best part was that my whole breakfast area smelled like Christmas from the Douglas fir and cedar, which was truly amazing. It smelled so good that we were actually having issues keeping Rylie off the table since she LOVED the smell of the flowers. Overall, I am extremely happy with this holiday arrangement and can’t wait to send this arrangement as a gift this holiday season! Teleflora Vintage Sleigh Bouquet: Where to Purchase? Want to purchase one of these beautiful holiday arrangements for someone on your Christmas list? 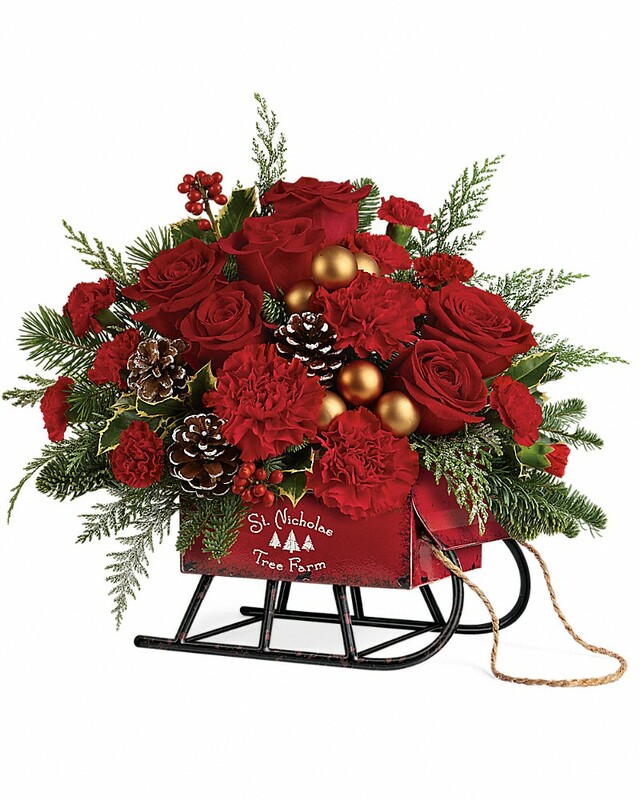 You can find the Teleflora Vintage Sleigh Bouquet on the Teleflora website for only $64.95. As well, don’t forget to check the other exclusive Christmas arrangements from Teleflora on their website! Wow!! This is gorgeous!! I love that it was so fresh that it smelled amazing!! And how adorable is that adorable little sleigh it’s in!! Teleflora always has beautiful arrangements for so many occasions. We have purchased through them many times. This is another gorgeous one. I really love these flowers. Any other colors you offer? That’s pretty. I imagine that it smells good and lasts quite a while. What a beautiful holiday bouquet! This would make a wonderful gift to send to family or friends. I’m so glad I can to this post & that I took the time to watch the video, I’m actually sitting here with tears dropping down my face, because of the amazing & brilliant message that teleflora spoke so loud and clear, in the softest of ways! This is what America needs, is craving & crying out for! Kudos to #Teleflora!!! These flowers are so pretty! I’d love to send some to my mom and my hubby’s grandmother on Valentine’s Day! I know they would love a surprise like that.